OK. I admit it. I've collected Angkor Wat pictures but I've never been to Cambodia. Friends of mine live there though. One American friend took these pictures of Angkor Wat temple and now, more than ever, I want to visit this ancient place. So did 600,000 tourists in 2005, which gives an idea how popular a tourist destination this is -- it accounts for half of Cambodian tourism! North Americans like me are impressed by the age of 200-year-old things. As I live in China I have to remind myself that here in Asia, 200 years isn't much. 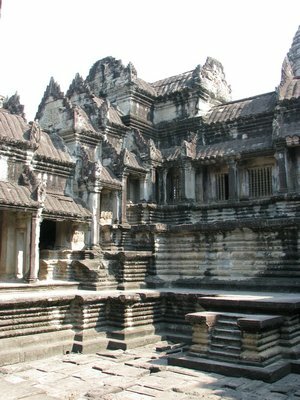 If you like ancient history, Angkor Wat is a place to look - it is 900 years old. 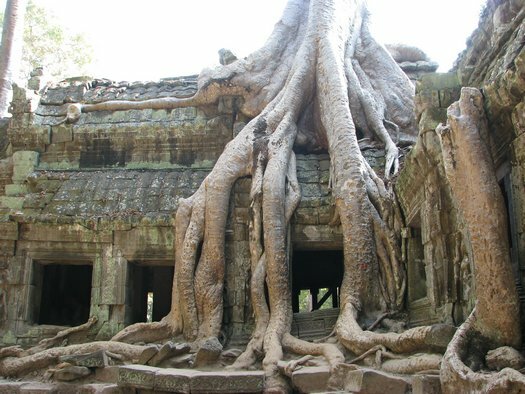 What was this Angkor Wat architecture like before it started falling apart? If only we had pictures of Angkor Wat from that time, how much more would we admire the artistry of the architects and builders? Among the fallen walls and worn masonry you can see in the Angkor Wat temple, a friend found this masterpiece of light and shadows. 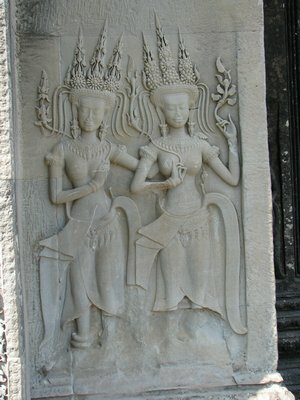 Angkor Wat is known not just for the buildings, but also for the carved artwork on the buildings. 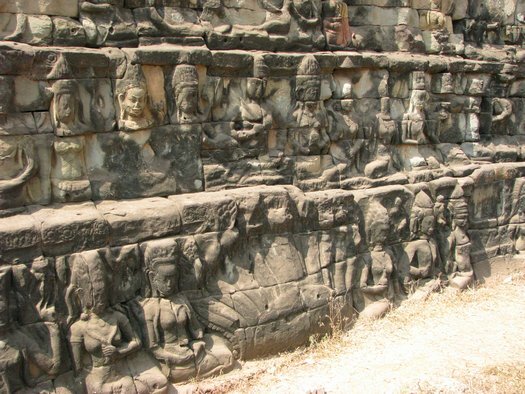 Even though worn by centuries of exposure to the elements, look at the beauty of these bas-relief carvings on towers and walls in the picture below. Imagine what this wall below must have looked like in its prime. 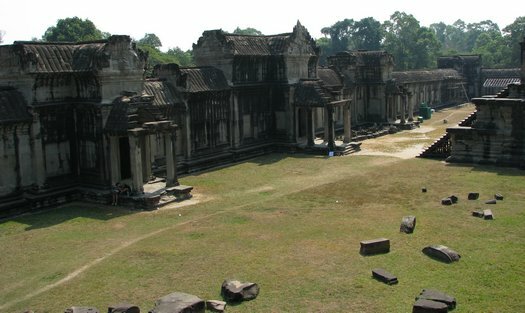 Early in its history, Angkor Wat must have been even more awe-inspiring. 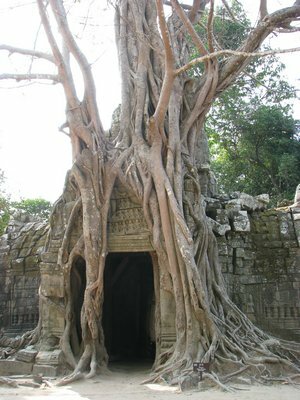 The Angkor Wat pictures below show that what man makes will be reclaimed by nature when it has the chance. Look at the jungle gradually overcoming man's best efforts. 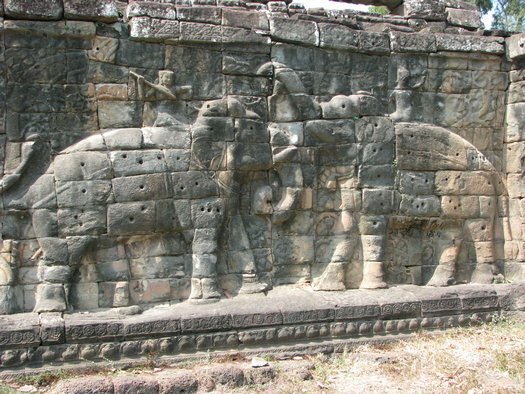 Elephants are greatly honoured in several Asian cultures. They're used for work, war, and worship. We shouldn't be surprised to see elephants here in this temple. Look at the detail on this beautiful sculpture. How were those intricate parts conserved? In Hindu the word for deity is deva. What you see here are devatas, a sort of Hindu guardian angel usually portrayed as female. 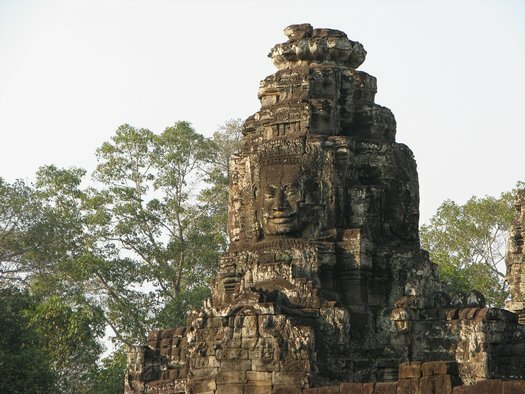 "Wat" is the Khmer word for "temple". Here'a a bit of Angkor Wat history: Keep in mind that this whole structure was, and to some extent still is, a Buddhist place of worship. Actually, originally it was a Hindu temple dedicated to Vishnu. How did it change? 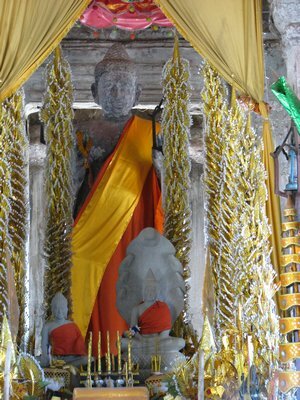 In the 13th century King Jayavarman VIII, a Hindu, was succeeded by his son-in-law Srindravarman, who was a Buddhist monk. 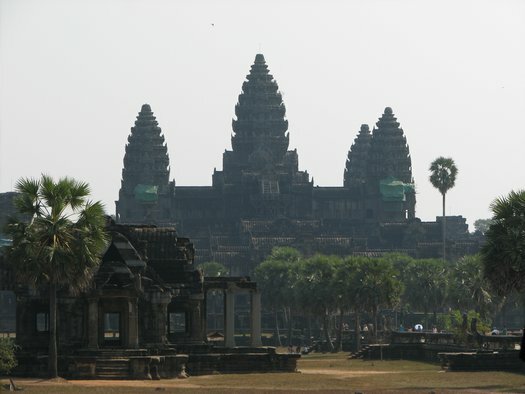 The new king changed the state religion and Angkor Wat was retrofitted as a Buddhist temple. 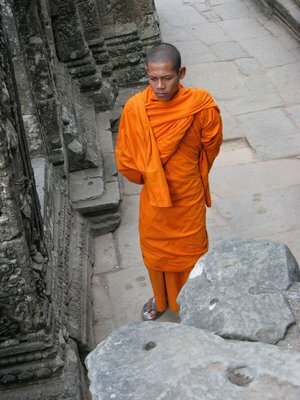 In Cambodia and Thailand, monks are seen everywhere. Naturally, some are at Angkor Wat. My experience with monks in Tibet and Thailand is that they're quite friendly. Be careful though: in southeast Asia, protocol demands that you be very careful not to touch them, no matter how crowded it is - particularly if you are female! Obviously, the mother in the picture above takes her beliefs seriously, though her daughter seems more interested in other things. 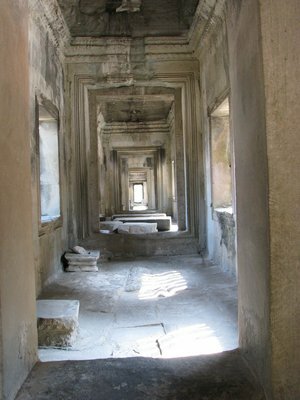 Above is the last of my Angkor Wat pictures. 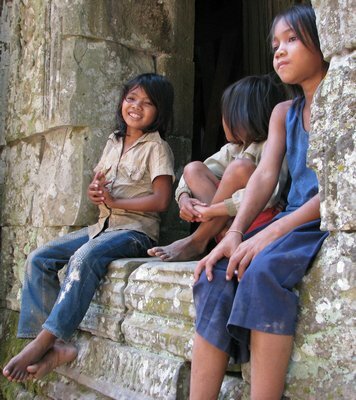 It's just a reminder that in Asia, even among ancient ruins, we'll always find fresh life and smiles.